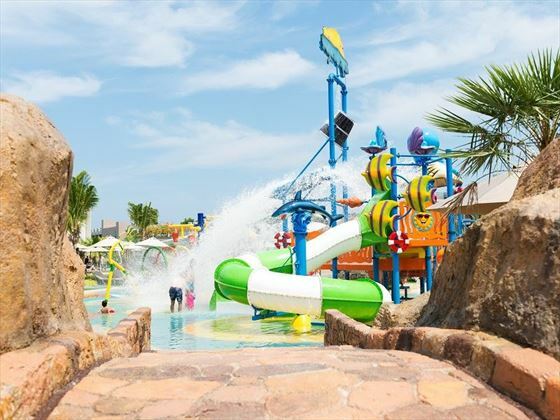 The Lagoon wing boasts a tranquil ambience and beautiful lagoon views, whilst the Aqua Wing is filled with family-friendly fun including water features, slides and a lazy river. 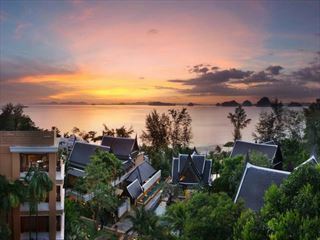 The Seaside Wing is chilled and laidback, with rejuvenating sea breezes and tropical garden views. 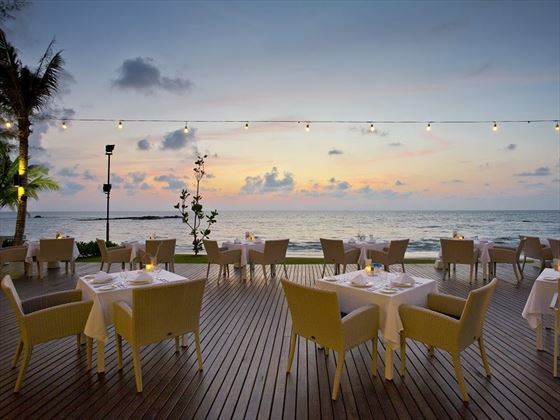 Whether you fancy unwinding or spending time in the pool, there’s a number of brilliant restaurants to keep hunger at bay. 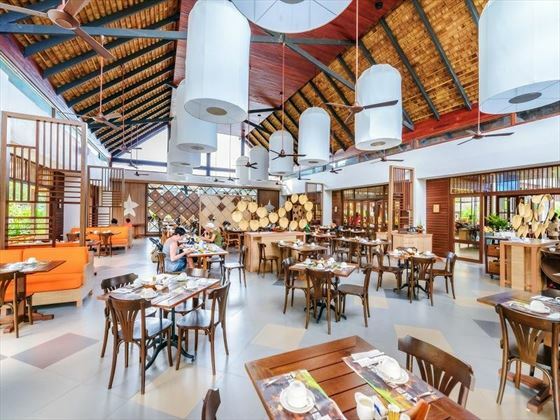 The Floating Market is a picturesque restaurant with delicious international cuisine, whilst Manta Ray Restaurant offers family favourites for every part of the family to enjoy. 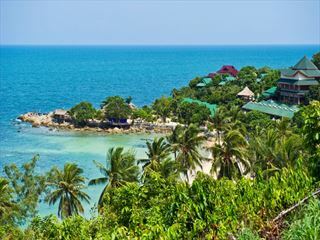 Surrounded by lush tropical hills in serene paradise, the Sands Khao Lak Resort is on the Nang Thong Beach resting among its soft, golden sand. 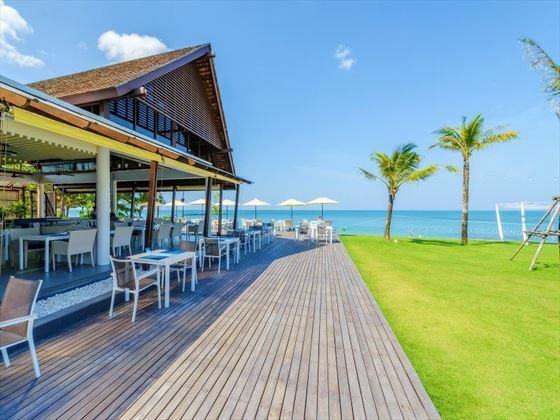 To arrive at The Sands Khao Lak, the nearest airport is Phuket International Airport, located 60 minutes south of the resort by transfer. 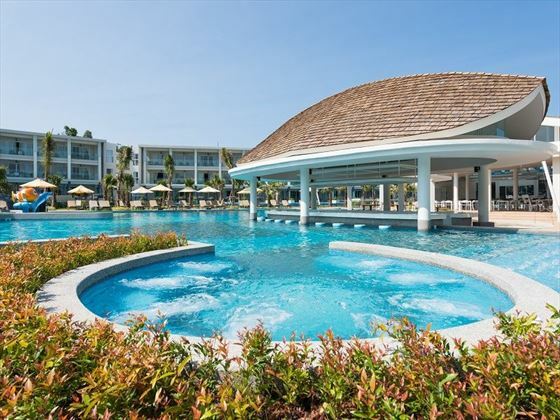 Lagoon Wing – surrounded by lawns and the serene lagoon. 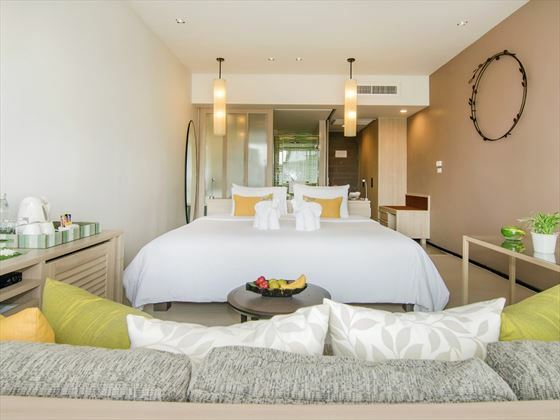 Pool Access Junior Suite – enjoy a personal plunge pool close to the accessible resort pool only steps away. Suits couples looking for peace and a generously spaced room. 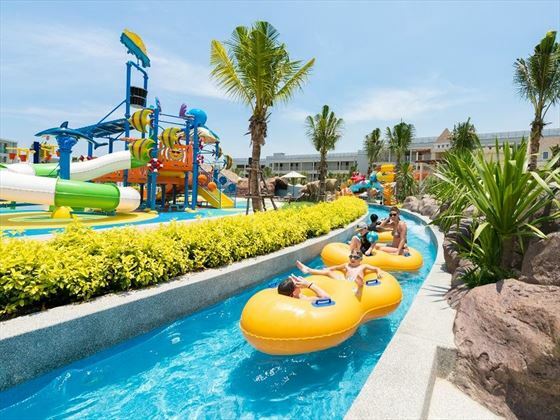 Aqua Wing – featuring a mini water park with slides, a lazy river, the Kids club and many more indoor and outdoor activities – perfect for children and families of all ages. Family room – decorated in a marine theme, offering a spacious room with a partition to separate each room allowing for privacy. Sleeps a family of 4. Pool Access Family Room – perfect for families wanting to enjoy the water. A spacious family room for 4 with extra terrace space and just steps away from the pool. The terrace features a glass door with an external lock for your children’s safety. Two-Bedroom Teen Suite – perfect for families with up to 3 teens (and/or tweens), offering 2 separate bedrooms for parents and children as well as two bathrooms. The teen room comes with bunk beds and a sofa bed allowing space for 3 children. Two-Bedroom Teen Suite Pool Access – similar to the previous room only with pool access right from you private terrace. 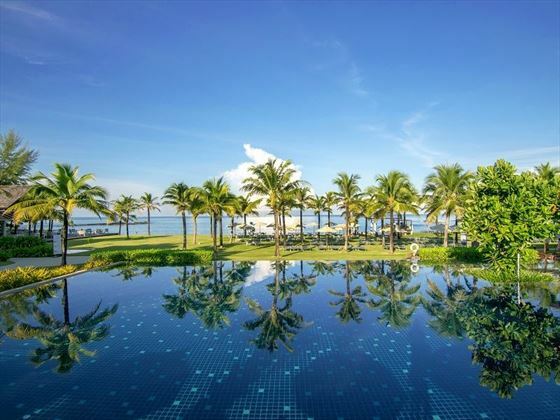 Seaside Wing – refreshing natural spaces with gorgeous tropical gardens and close beach proximity, guests can enjoy the pools swim up bar, massage Sala and stunning sea views making it perfect for relaxing, rejuvenating and refreshing. 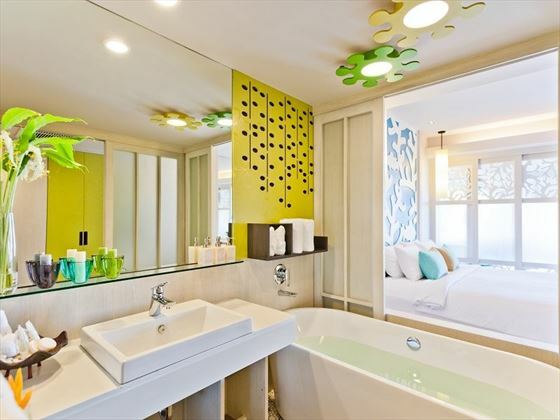 Seaside Junior Suite – spacious rooms with gorgeous ocean views from your day lounge and balcony. With a soft colour scheme, it feels truly tropical, great to unwind in the indoor living room. The Sea suite – panoramic sparkling sea views, a grand balcony extending onto the spacious living area and majestic bed chamber. En-suite is complete with a Jacuzzi and rain shower. 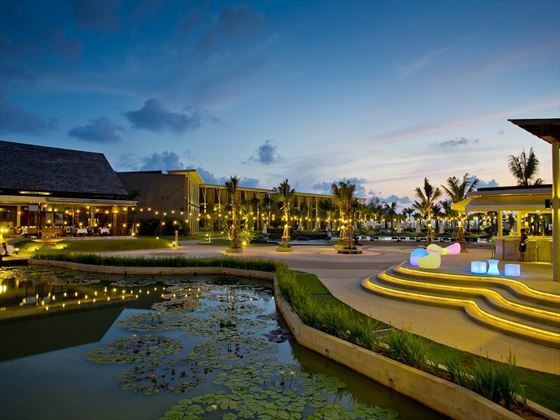 Mango Bar – next to the Floating Market restaurant overlooking the lagoon, offering serene surroundings, all day refreshments and evening entertainment. Sands Castle Kids Club with fun activities including a ball house, trampoline, outdoor playground, superhero and princess corner, creative arts and crafts corner, book corner, real life station, game arcade and rock climbing! 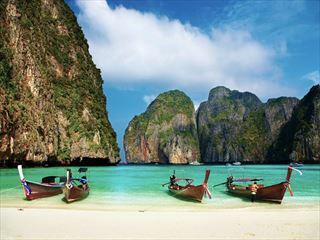 Honeymooners will receive welcome fruit, flowers, bed decoration and a honeymoon cake.